The highlight of our first (and only) full day out in the jungle proper – day three of our five-day adventure – was a three to four hour hike through the trees, wildlife-spotting. Before that, though, we needed sustenance. 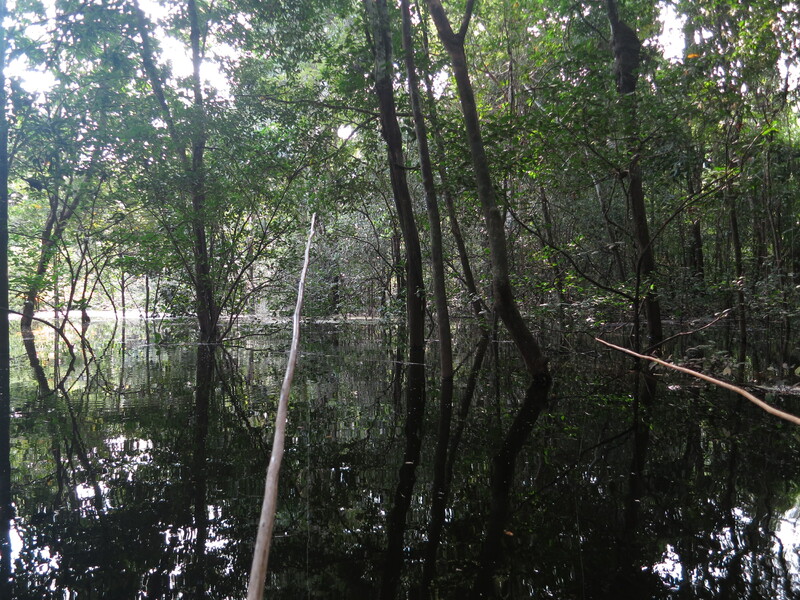 Yesterday, when we were off in search of anacondas, Rusber had set a fishing net near the other campsite. Last night, when we’d gone frog-spotting, we’d checked it out in hopes of what would be this morning’s breakfast: we found three piranhas, plus the front half of a fourth. Presumably there was a fifth swimming around somewhere with a full stomach, feeling pretty happy with himself. Plus there were two ‘walking fish’ and two catfish. When we arose this morning, these were already being prepared for our breakfast. It was simple fare: a thin oily, garlic-y soup with whole fish floating in it. But it was remarkably good. 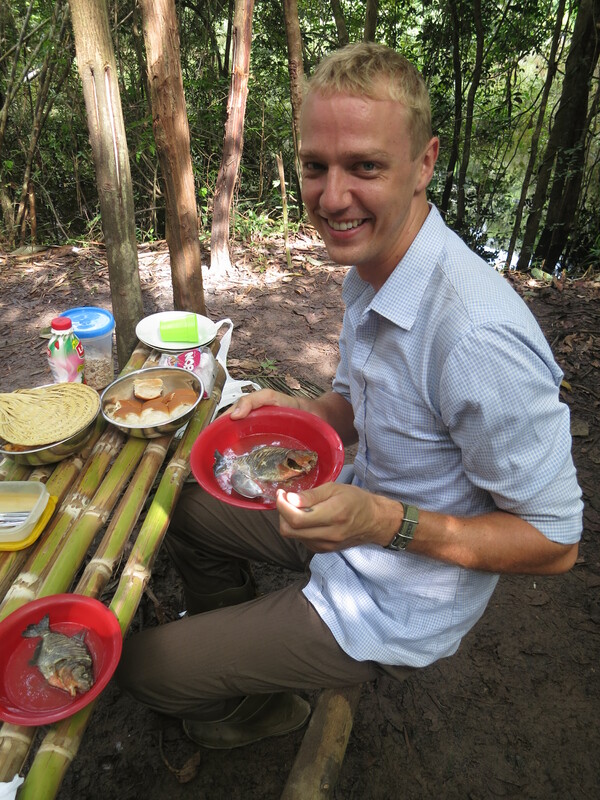 Eating piranha is much like eating other fish: there’s not any particular special taste to it (or if there is, it was cunningly disguised by the garlic and oil). But picking at the carcass, you do have to be careful of the teeth. We followed our soup with some more incredibly fresh fruit salad, and we were ready to go. Speaking of ready to go, we actually weren’t quite set to be off for our walk until right after a quick visit to the, err, jungle bathroom: a short track out into the undergrowth, at the end of which you can pick whatever area looks least prickly/insect-ridden and squat and go about your business, as you watch the ants and spiders go about theirs. One of the less restful restrooms I’ve been to, but I’ll grant that it did definitely add to the authenticity of the jungle experience. Anyway, this was the highlight of the whole excursion. (The jungle walk, not the making like the Pope.) Much of the path we followed through the jungle had surely been taken by plenty of other tourists before us, but it was hardly a well-marked trail. Many a time, forward progress required some eager machete-work on Herman’s part. 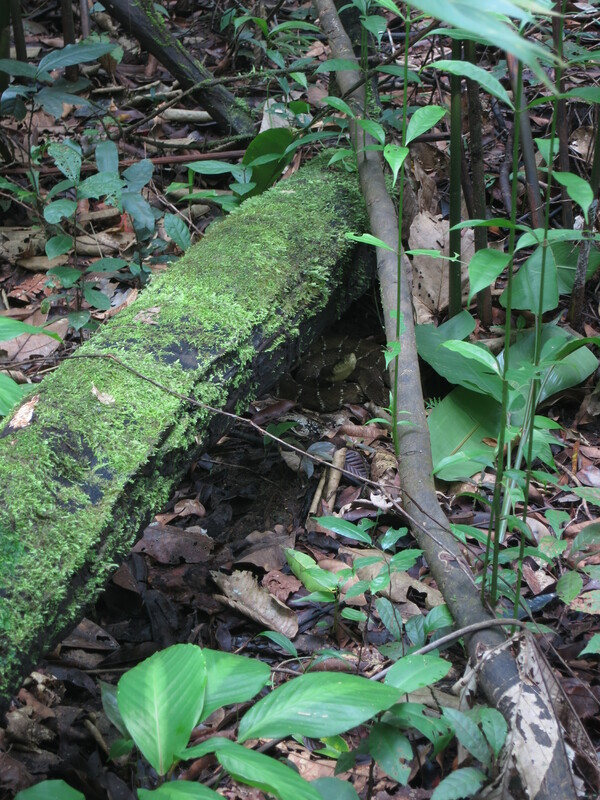 We might not have been trailbreaking pioneers, but we were very much immersed in the natural environment of the Amazon, about as far from civilisation as you’ll get without actually being lost. And we were thoroughly surrounded by the teeming life of the jungle. If I sit here and write out a detailed catalogue of what we saw, though, we’re going to end up with a bullet-point list a mile long. The jungle environment is so different from our normal everyday experiences that every moment of our walk was spent spotting new wonders to steal our attention from the ones we discovered (or had pointed out to us) minutes ago. So for the most part we’ll go with some photos instead. Climbing on the root system of a tree hundreds of years old. The jungle is a fascinating mix of old and new. While much of the undergrowth is young – constantly growing, dying and being reborn anew – some of the arboreal behemoths we saw were as much as five hundred years old. The above-ground root systems of many of the trees – young and old – had a glorious dishevelled look to them, twisting and turning their way around for no particular reason, like an organic game of snakes and ladders. The older ones were simply enormous at the base, spreading out to claim huge patches of earth beneath their impressive canopies. 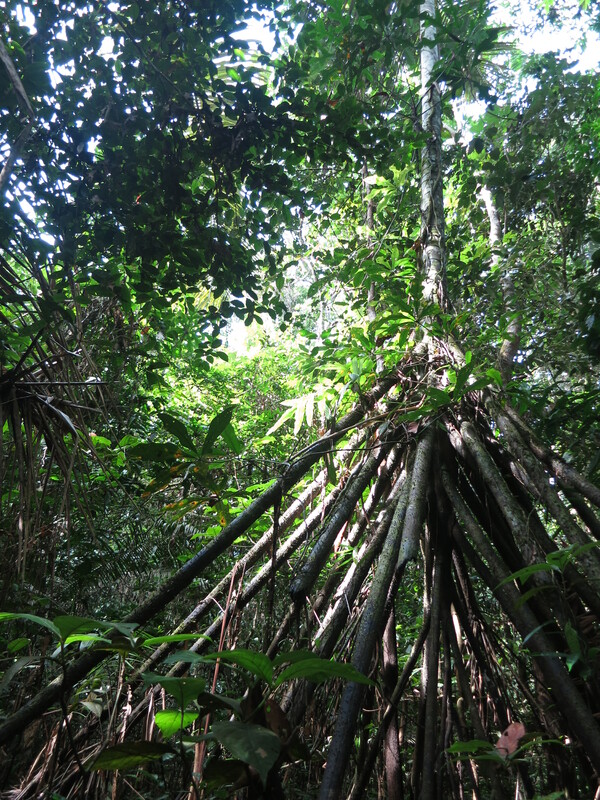 Other trees had simpler strategies, just splaying their roots directly outwards in a tent-like sort of structure. 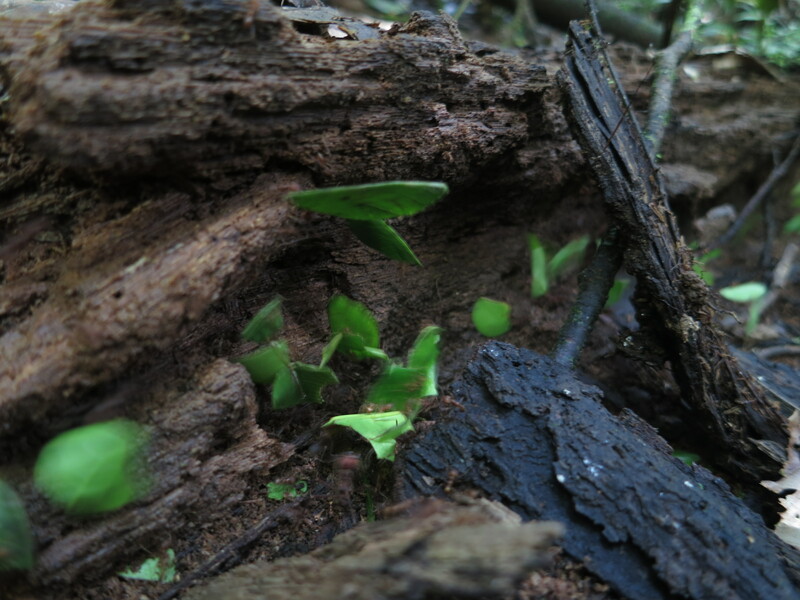 A procession of leaf-cutter ants on a fallen tree branch across the path. I knew that there were ants in the jungle, definitely. I’m sure I have vague memories of David Attenborough telling me so as I channel-surfed one bored night many a year ago. But I didn’t expect so damned many. They were everywhere! Often, our path would traverse unexplained bumps, and we’d look back and discover that the mound we’d just walked over was an enormous ant hill, literally four or five metres in diameter. 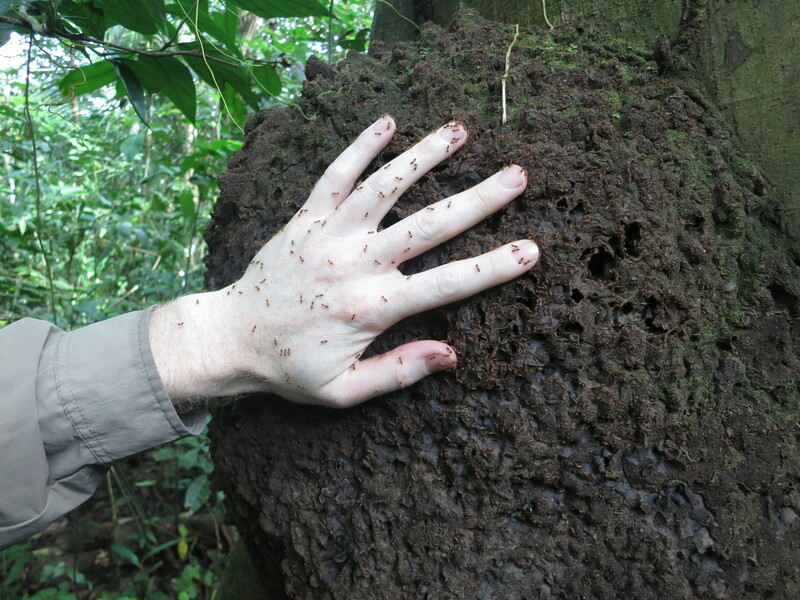 A termite nest on a tree, complete with Chris’s hand, covered in termites. This functions as a natural insect repellent: let the termites crawl all over your hands, then rub your hands together vigorously, squishing the termites and spreading the resulting oily ooze over your skin. It’s less unpleasant than it sounds, and surprisingly effective. Similarly, if there’s a termite nest near your campsite, you can, it turns out, treat it as a jungle version of a citronella candle and just burn it of an evening to keep the bugs at bay. For some reason, Herman seemed to get a lot more enjoyment out of that type more than the smothered-over-hands type. 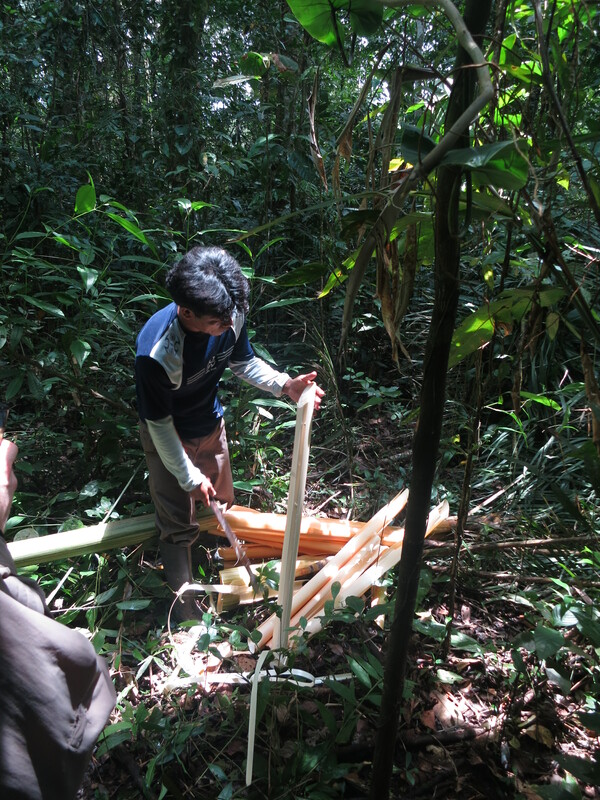 Cutting up a palm tree which Herman has just felled with his machete. The outer layers of the palm peel off to leave a soft, fleshy but fibrous heart which went straight into a nice fresh salad for lunch when we returned. But the photos aren’t enough to capture everything. Partly, that’s because there’s a huge variety of things we didn’t see, but which contributed to the experience as well. We didn’t see any caiman (yet), for example, although we heard several, including one large one which we spent quite some time running around trying to track down. There were two animals for which we only saw tracks, too: a large tapir, whose size Herman guessed at about 300kg, and a giant (dog-sized) rodent whose name I can’t remember, but which we later saw in Pilpintuwasi animal sanctuary in Iquitos (there’s a picture of one in the post on Iquitos, if you want one). Partly also it’s because much of the fun was in the overall experience rather than just the (admittedly captivating) visuals. I have photos of me swinging Tarzan-style on a giant vine, for example. But I just look like an idiot hanging there with a dumb grin, and the photos hardly convey the fun of dicking about in nature, just playing. Nor would a photo have adequately captured us chasing after the sound and confusion of a troop of monkeys hooting through the branches about our heads, off to their next party location, even if we’d had the inclination to stop and take one. And the ‘jungle telephone’ trees – elderly giants with large hollow roots – are stationary and plenty visible, sure, but the point of them is the thundering boom they make when you strike their root systems: obviously something you can’t capture in a pretty picture. 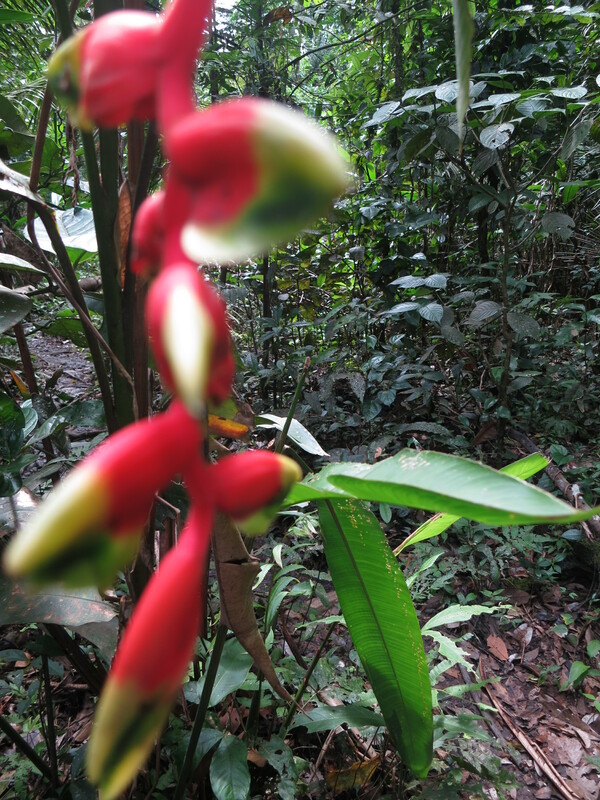 And even more than all that, partly it’s because much of the jungle is caught only in fleeting glimpses. We spotted a lot of frog’s homes (just shallow holes dug into the earth) as we wandered along, one or two with flashes of nervous-looking frogs inside. And in one of them I’m pretty sure I spotted a new inhabitant – a spider, waiting to surprise whatever smaller prey might walk past after me. But I can’t be sure – there wasn’t time to look twice before the movement was gone, let alone time for a Kodak moment. Out of the corner of my eye I was constantly seeing small twitches of movement that revealed nothing by the time I turned to pay further attention. It was a central part of the experience knowing that for every creature we saw, there were uncountable numbers just as close but staying just beyond the corners of our eyes. Hell, I wouldn’t even have seen the lancehead snake we came across had it not stayed put, coiled up hidden under the fork of two fallen branches lying across our path, for long enough for Herman to point it out and warn us away. So I guess you’ll just have to make do with those few photos, and with my repeated insistence that the jungle really is another world, and that our hours of wandering around with Marden and Herman really were the best way I can possibly imagine to experience it. 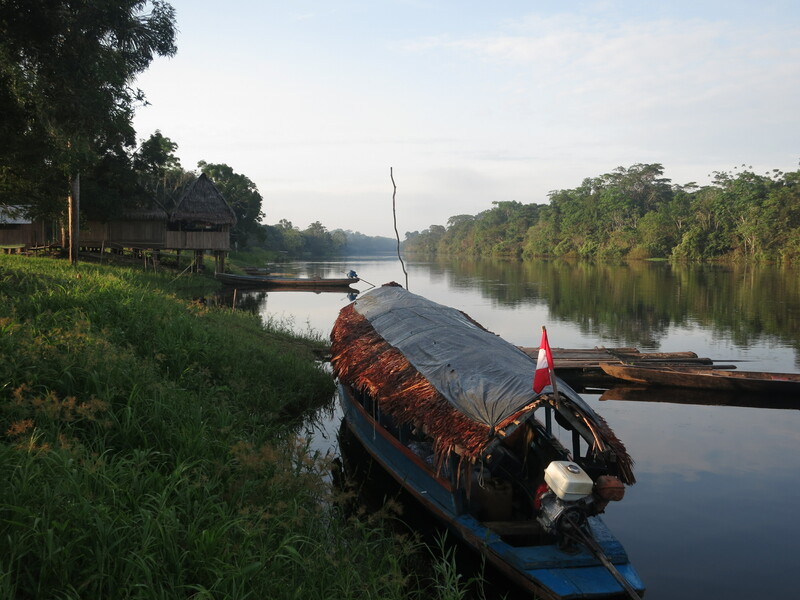 Our time in the Amazon was the end of January, well into the wet season. Not at the river’s highest – the waters peak around March, one to two metres higher than during our time there. But already eight to ten metres above their lowest. The huge changes in the volume of water are difficult to conceptualise, but the difference they make is enormous. There just isn’t nearly as much land to explore in the wet part of the year – the rivers really take over. And the distribution of the wildlife is markedly different. (For a start, there are a lot fewer mosquitos in the dry times, I’m told!) For tourists like us, that means there’s less to explore on foot. So the walk we just took was the only one we’d take: captivating as the stroll had been, the rest of our time was spent on the water, fishing for piranhas, with eyes peeled for caiman, otters, dolphins, and birds. We spent some time in the water, too. After we’d returned from our walk and lunched on more piranha (this time in pasta), Herman and Rusber took us upstream in the middle of the river for us to jump off for a leisurely and incredibly refreshing swim back down to the campsite. Well, the swimming downstream was leisurely, anyway. There was a reason they took us upstream before we jumped in: swimming upstream against the current was… challenging. Of course we had to try it. I’m not a great swimmer, but I’m certainly competent. I won’t be winning any races any time soon, but I have reasonable stamina, I have less surface area to present drag to the water than I used to, and my technique is not abominable. In this part of the river, I found that swimming freestyle at full tilt, I could make one or maybe two metres progress per minute. As in, the myriad ants we saw on shore would have been beating me. We went for a swim the next day, too – this time downriver, after the point where the Yanayacu River joins the Pucate, downstream of Buenos Aires, with stronger current. Full tilt here had me staying exactly put as massive volumes of water rushed on past. It’s a humbling feeling putting your full energies into going that-a-way only to be entirely defeated by nothing more than the natural course of a placid-looking expanse of water slowly making its way on its thousand-odd-kilometre journey out to sea. Especially knowing that there’s a lot more water, from hundreds of other tributaries, to join in and strengthen the flow before it gets there. 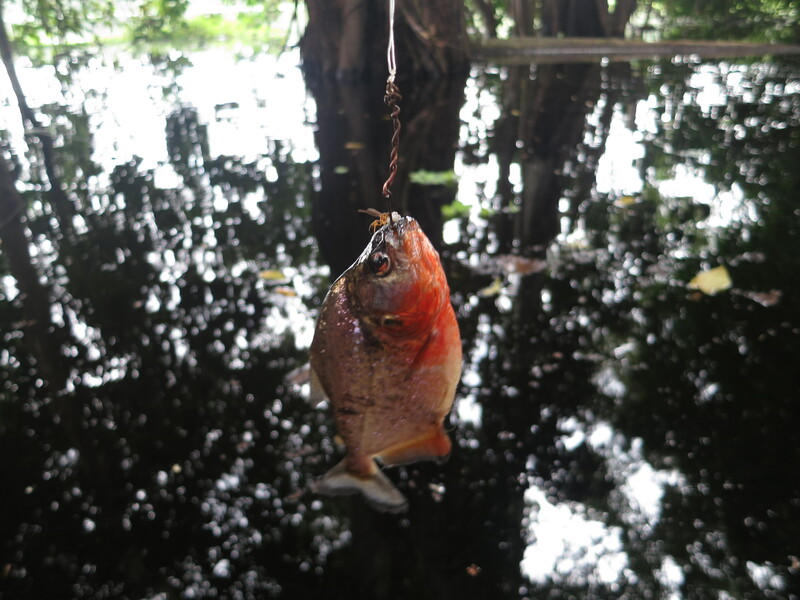 Much of the rest of our time in the Pacaya Samiria National Park was spent piranha fishing and searching for caiman. These are two of the iconic Amazon River tourist experiences, I guess, so our guides were keen to make sure we ticked both boxes. We spent so much time doing both, though, largely because we were so stunningly unsuccessful at them. Piranha fishing. Not pictured: piranhas. Our piranha-fishing expeditions, unsuccessful as they mostly were, were a lot of fun. They started so promisingly: Herman cast his homemade bamboo rod out first and very quickly caught a couple of bait fish, including one where he fortuitously (no doubt he’d tell you just ‘skilfully’) managed to land the baited hook right in the fish’s mouth and pull it straight back, having barely touched the surface of the water. We were suitably impressed, and excited: this was obviously going to be easy – surely we’d be returning to camp with a productive catch for dinner. It wasn’t to be, though: Chris managed a small catfish, Marden caught a small sardine-like something, Herman chipped in with another bait fish, and I adroitly caught me some vegetables. We tried a few locations over a couple of days, all with pretty similar results. Some spots were more promising than others: those were the ones where at least we managed to entice some piranhas to eat our bait, even if they wouldn’t get on the damned hooks. At least our lack of a catch was reassuring us that going for a swim in the murky water mid-river had been a not completely ludicrous activity. Still, eventually, on our last outing, we caught a few: Herman spotted a termite nest on a tree above the water, and gave it a good poke to break it up a bit and spill some contents into the water. That enticed the little marine bastards to start feeding, and once they got going, and once we’d churned through a tonne more bait, we finally started getting results. Our search for caiman was a similar story. After many a fruitless tour of the river, at one point, Herman became quite excited and insisted on squeezing the boat through the vegetation to get closer to the shore. He promptly clambered over a tree and off into the jungle, disappearing for a good five minutes. 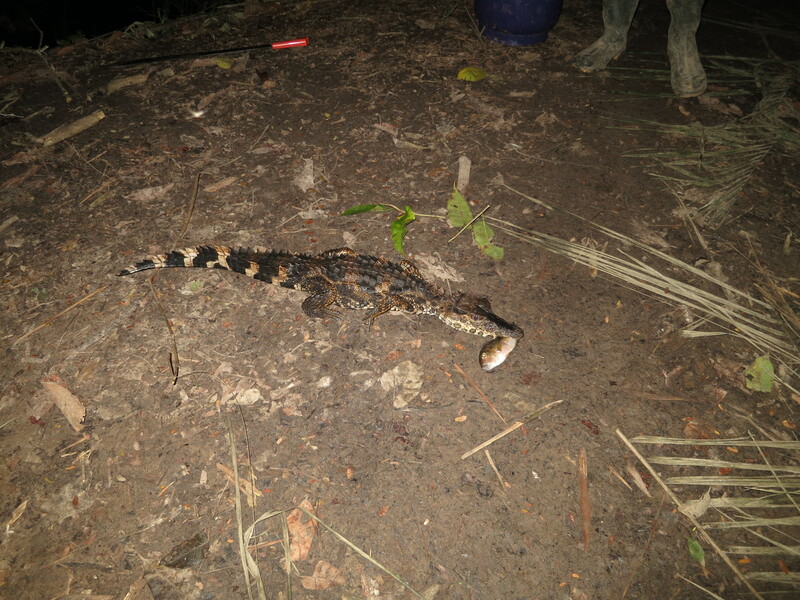 But he came back with a baby ’gator (well, caiman) and a broad grin. We took a few photos and then plonked it on the boat (suitably restrained, of course) to take it back to camp: Herman thought we should get some photos of it with a fish in its mouth (and all the fish we’d caught were in the canoe back at camp, not in the main boat that we were in at the time). So we did that, then Herman gave the relieved animal a bit of a gentle shove and it raced off into the water. So, I guess with the piranha fishing and caiman spotting complete, that probably adequately describes the rest of our fantastic Amazon trip. On our way back to civilisation, we spent our last night in Buenos Aires village again, in Herman and Wilma’s home (a basic open-walled pole house on the edge of the town’s main playing field). 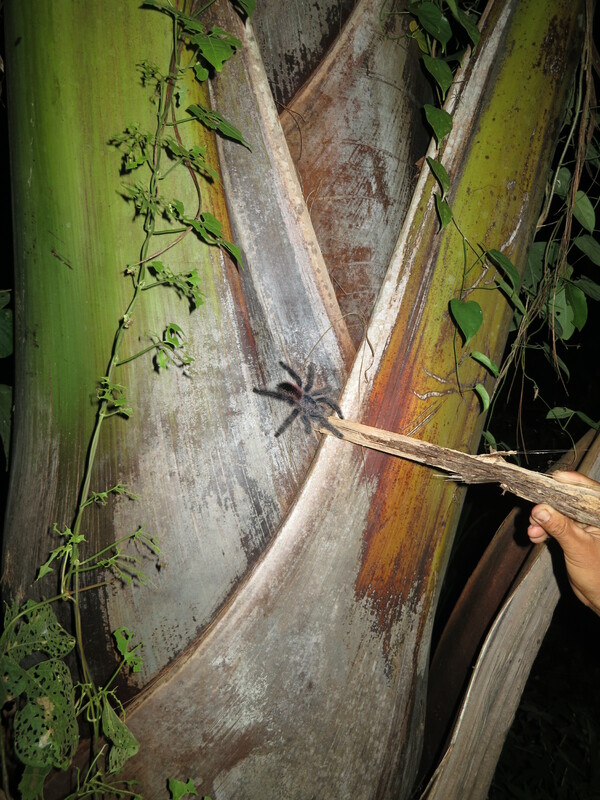 There’s a tree behind their house which is home to a couple of tarantulas, which Herman showed us with an almost familial pride. Chris and I decided later in the evening that we wanted a second look, though, so we wandered back. We were made to promise first that we’d be very careful, however: tarantulas are quite poisonous, they said. This intrigued me: so far as I knew, tarantulas were actually fairly harmless. So, when we got back, I asked (in what I hope was mostly intelligible Spanish). Oh no, I was told, muy venenoso (‘very poisonous’). Ok. So, what does ‘very poisonous’ entail, exactly, then? Oh, if you’re bitten, it will be bastante penoso (‘quite painful’), and you will need to be treated with medicine. Within probably a few days. Or you will get quite sick. There followed a very entertaining conversation describing Australian snakes and spiders. (My Spanish didn’t extend to ‘box jellyfish’, unfortunately.) The locals were suitably impressed, and Chris and I (once I sort-of translated the conversation) were suitably reassured that when we’d been warned off the lancehead snake we’d almost stumbled over the other day, we hadn’t actually been in any substantial mortal danger. So there you have it. 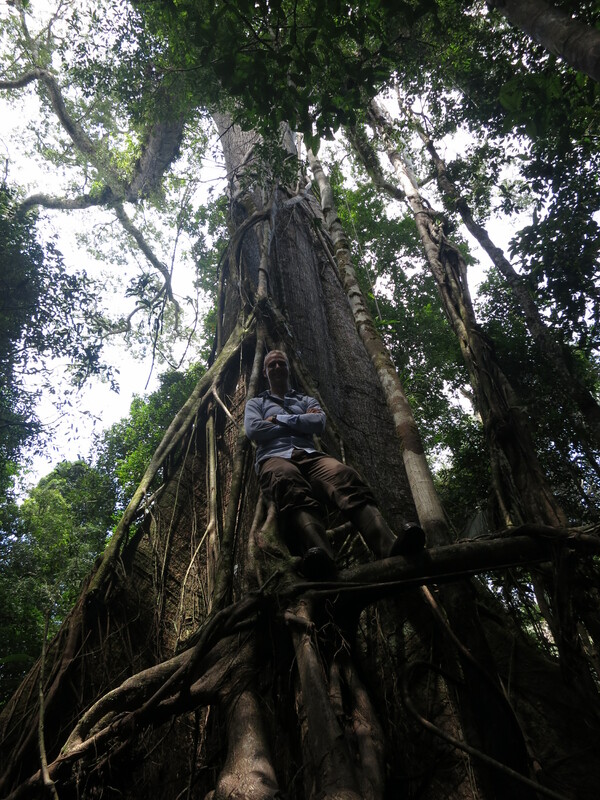 The Amazon jungle: a fantastic adventure, and not even particularly likely to kill you! Thats quite the jungle story, I enjoyed reading it. Nice post!